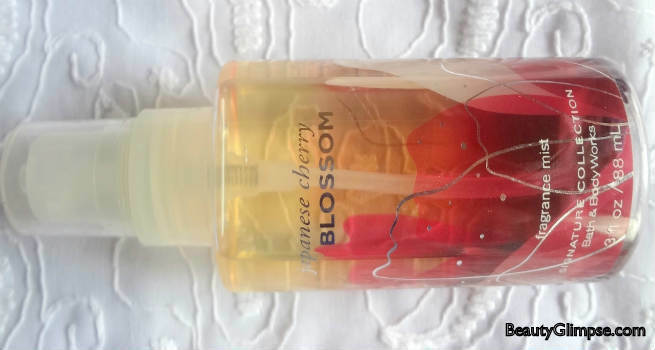 When it comes to bath gels, lotions and fragrances, nothing can beat Bath and Body Works – both in terms of the variety and the quality of the products. Their website is a splash of bright colors that just takes your breath away. So when a friend was coming down from the US, I asked her to bring back with her some body mists for me. They come in mind blowing flavors and I had a hard time choosing which ones I wanted. Finally I settled for Sweet Pea and Japanese Cherry Blossoms – two of their top selling fragrances that I am going to review here. I went in for the travel sized body mists which comes in a nice transparent plastic bottle with a spray nozzle and a transparent cap. It costs $6 for an 88 ml pack, but if you are buying it during the Christmas season, you can mix and match 3 products and buy them for $12. So that’s effectively $4 per product, or close to Rs.240. You can also get the 236 ml bottle from online stores like Flipkart in India for Rs.1100 while the same is priced at $14 in the US. Product Description : Lavishly splash or lightly spritz your favorite fragrance, either way you’ll fall in love at first mist! Our carefully crafted bottle and sophisticated pump delivers great coverage while conditioning aloe mist nourishes skin for the lightest, most refreshing way to fragrance! It is a nice and light sweet fruity fragrance that has top notes of Sweet Pea and Pear and mid notes of raspberry and peony. It is a mood enhancer. I spritz it on after a bath and it leaves my skin soft and smelling great! The fragrance lasts for 3 to 4 hours easily. It makes me feel girlie and fun. Works great for the day, especially the summers, when you want to smell flowery fresh. Japanese Cherry Blossom has been the number 1 fragrance in their range for quite some time now. And why not, when it leaves you smelling and feeling beautiful! It has a slightly stronger fragrance when compared to sweet pea due to the hint of sandalwood in it. Its got Pear and Fuji Apple as its top notes and Cherry Blossom and Lily in its mid notes. Making up the base notes are cinnamon and sandalwood. Again, on spritzing it over my shoulders and neck and wrists after my bath, I find that the fragrance lasts until lunch. It turns slightly woody as the day progresses. Not so easily available in India, prices abroad are much less during the sale season. The bottles I have will last me a couple of months for sure after which am going to be getting a few more of these beauties for sure!